We’ve developed the open-source stream downloader, DOWNstream, as a free plugin for video player apps built on the Electron framework. When used in conjunction with our free custom Electron build, your native Windows™ and Mac desktop apps can also playback DRM-protected content online and offline. Offline playback is a feature OTT streaming services can use to extend their customer’s viewing options. You can achieve this through standalone desktops apps using three components: our desktop app environment supporting DRM, our DOWNstream content downloader, and player logic. Working with Google’s Widevine DRM team, we’ve released two of these projects for free to simplify offline-enabled experiences when leveraging Electron to build video players. 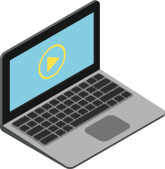 The standard Electron framework allows you to publish native Windows and Mac desktop apps, but with our free software you can also make DRM-protected video available for playback across these operating systems. We supply a custom Electron build that adds important content security features to enable DRM for both online and offline playback use-cases. Added features include: Google’s Widevine CDM, Google’s Verified Media Path, and persistent sessions. To provide offline playback you must securely manage the download and storage of video content. DOWNstream is our open-source plugin for use with Electron allowing encrypted MPEG-DASH streams to be safely downloaded and stored locally on a user’s Windows or Mac computer. If you wish to provide native Windows or Mac OS players for studio content then you’ll also need a playback component supporting DRM and persistent licensing. You can build this from scratch or take advantage of PRESTOplay for Desktops. Our feature-rich SDK offers a rapid development environment making it easy to build both online and offline player apps. Interested in players on other platforms? 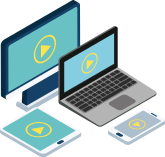 Check out our full range of video playback SDK technology. Mac is a trademark of Apple Inc. Windows is a registered trademark of Microsoft Corporation in the United States and other countries. Google, and Widevine are trademarks of Google Inc.